Edward Mirell is the global leader in the design and manufacture of contemporary jewellery. Edward Mirell’s cutting edge patented technologies combined with their well respected design team produce some of the most incredible pieces of jewellery on the market. 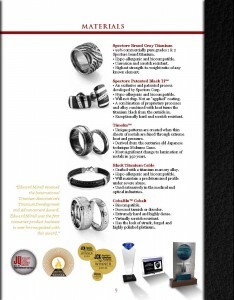 Award winning Titanium rings, ground breaking Cobalt alloy’s and patented Black Ti means that Edward Mirell is the world leader in many aspects of modern Jewellery. We are very proud to be in partnership with Edward Mirell as both our companies have similar goals. We believe in unique high quality jewellery and delivering the best service possible to our customers. Alpha Rings is the first online company in Australia to work with Edward Mirell. This is something we are very proud of! Check out our catch ups with Adam Rosenberg from Edward Mirell! Can give us a brief rundown of how Edward Mirell came to be? What does Edward Mirell stand for, and how do you want to be known in the marketplace?